Salaries for blockchain developers are up again, with annual pay soaring by more than $4,000 over the past six months for those in the highest bracket. And the rush to embrace distributed ledger technology is also pushing pay up for related jobs, according to a new report. 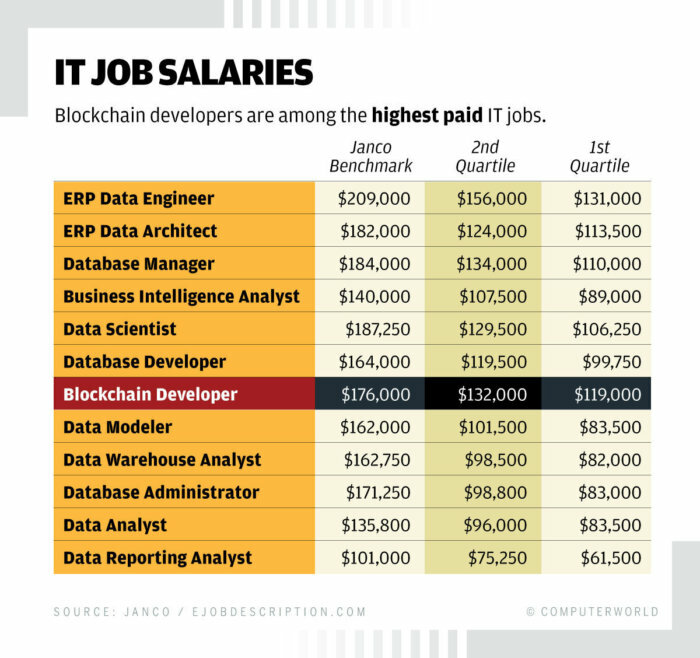 The median annual salary for a blockchain developer is now $132,000, with experienced workers commanding upwards of $176,000 a year when they move to new organizations, according to Janco Associates, a management consulting firm that conducts regular salary surveys and updates its report biannually. 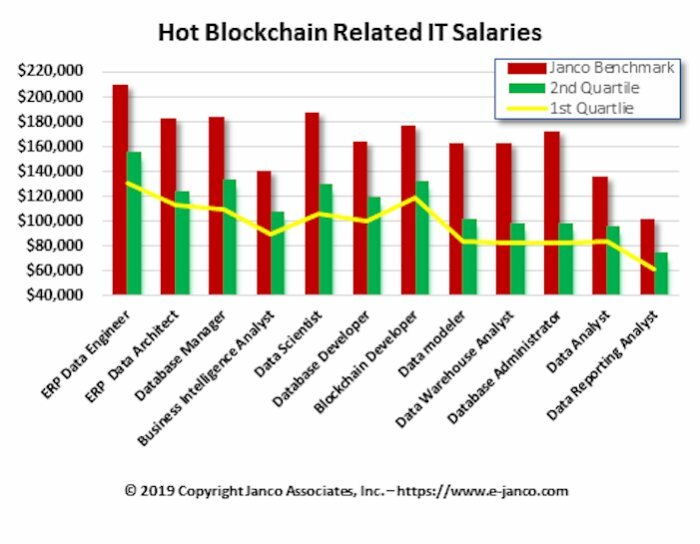 “Salaries are up across the board for all blockchain roles that we have surveyed,” Janco CEO Victor Janulaitis said via email. Previous job reports have estimated the number of open blockchain developer positions at more than 10,000. For example, in October, job data analytics firm Burning Glass Technologies pegged the number of blockchain-related IT jobs at 12,006, which at the time represented a growth rate of 316% year over year. In June, Burning Glass had reported 5,743 blockchain developer jobs. In December, LinkedIn placed blockchain developer as the No. 1 emerging job. Hired, a job recruitment firm, placed the salary for blockchain engineers as ranging from $150,000 to $175,000 a year; those jobs are now on par with developers of artificial intelligence (AI). As blockchain jobs have grown, so too have programs that train developers and others in blockchain skills. For example, after creating an online course on cryptocurrencies and business-scale blockchain networks, UC Berkeley quickly saw thousands of signups. Most of the pay increases over the past year for IT positions have been defensive in nature, Janulaitis said. Janco conducted several spot interviews with two dozen CIOs in December. All of those interviewed said they were actively recruiting IT professionals for new development activities and replacements for those who have left in the last few months. Attrition rates are the highest they have been in the last several years, according to Janco’s report. Janco also found that several organizations have slowed the hiring process as they work to absorb new hires. While jobs related to blockchain development have led others, such as database managers and data scientists, in growth, there are other roles in companies where recruiting is more intense. The emphasis in the past several years has been in both e-commerce and mobile computing, Janco reported. At the same time, with ever-increasing cyberattacks and data breaches, CIO are looking to harden their sites and lock down data access so that they can protect all of their electronic assets. 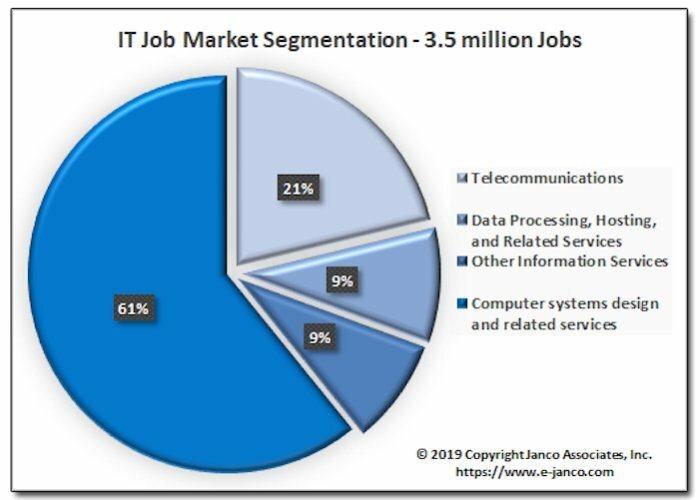 Overall, in 2018, there were 79,800 new IT jobs – 21,000 more new jobs than were created in 2017, according to Janco’s report. The median salary for all IT professionals based on Janco’s latest salary data is $93,077, which is $2,628, or 2.92%, higher than the same time last year. The only down factor affecting the IT job market is the recent downturn in the equity markets and a slowdown in China’s economy, the report noted. In addition, technology giants like Apple, Google and Facebook face the prospect of no to slow growth from international economic prospects and increased scrutiny due to privacy and security concerns. “This could be a dampening factor on U.S. IT job market growth,” Janulaitis said.